Itchy Forehead: What is it? How to get rid of them? Itchy forehead can be the most annoying thing ever! And if you have been finding it difficult to move your fingers away from your forehead then you are not alone. Don’t worry, it is not a sign of any serious health condition, however, prevention is always better than cure. The reason for an itchy forehead may be the underlying cause of it, such as eczema, contact dermatitis, dandruff, sunburns, stress, pregnancy or acne. Even certain cosmetic products can act, as the trigger. 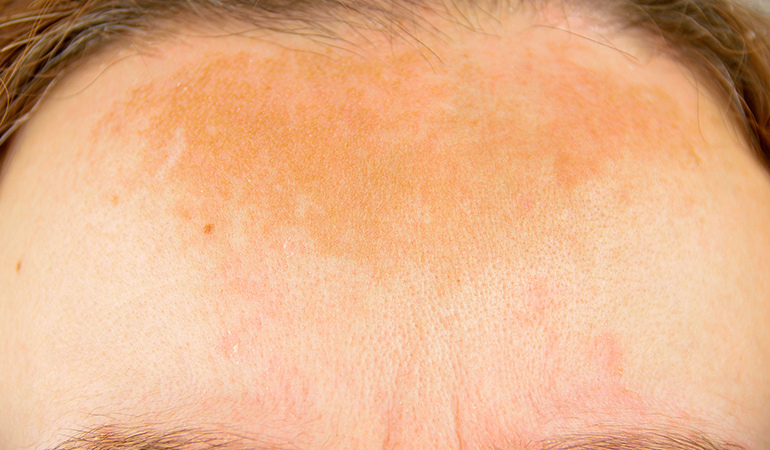 Given below are the most common symptoms of an itchy forehead. Sun attack! Yes, it can also contribute to an itchy forehead. Sunburns may often lead the skin to peel which causes an itching sensation. Psychological factors like stress, anxiety, depression, nervousness, etc. can lead to a habit like scratching your forehead. The hormonal, physical, and emotional changes during pregnancy can cause an itchy forehead. Sharing combs, hair brushes and headgears can cause dandruff, head lice, and other fungal infections to spread which may trigger itching. Whenever you have an itch, wash your face to ease the irritation. Pat it dry as soon as possible. • Don’t avoid the sunblock. • Use home remedies like aloe vera gel, olive oil, chamomile tea, oatmeal, tomato puree, etc. to sooth your skin. • After consulting with your healthcare specialist, use appropriate prescribed medicines.